With unemployment increasing, and hundreds of thousands more jobs facing the axe as a result of the cuts, the government is setting out new ways to punish the unemployed. The government is getting tough. Not on bank bosses, whose bonuses are back to pre-crisis levels. Not on tax avoidance by big companies, whose taxes are being cut. No, its the unemployed facing a crackdown. With the news full of stories about the “workshy” soon being made to clean the streets for their dole, you'd think that large-scale unemployment caused the economic crisis, not the other way round. We shouldn't be too unfair to the government. They don't just plan to harass the jobless into working. They also want to manufacture new jobs in the depressed heartlands of urban Britain by offering – surprise – tax breaks for businesses. These new “enterprise zones”, which the government claims can revitalise many local economies, have been touted as a quick fix for the economy and the jobs market. Unfortunately, the evidence shows they don't work. According to new research from the Work Foundation1, the overwhelming majority of jobs they create are simply poached from elsewhere in the country, and the boost to employment only lasts for a few years before the area slides back into depression. On top of that, each job costs on average £23,000 – more than the median annual salary in the UK. Obviously, the treasury can't afford to keep millions of unemployed fed, but they can afford huge PFI projects like this. Nonetheless, the main thrust of the government's strategy for growth so far is simply to penalise jobseekers. This is apparently is undertaken in the belief that they can make unemployment that degrading and unbearable that claimants will take whichever work they can find. March saw Tory Work and Pensions minister Chris Grayling outline new levels of conditionality attached to claiming benefits: the unemployed will be made to do various kinds of community service, including cleaning streets, litter picking and painting fences. Like community service it is compulsory, and like community service it is unpaid. 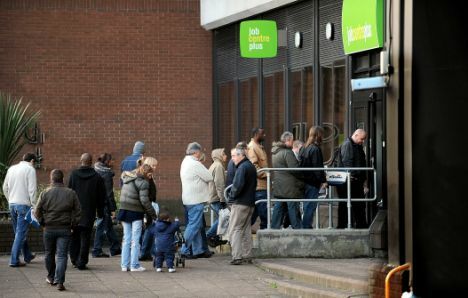 While the 'mandatory work activity' being imposed on claimants is not new, and was introduced in Labour's welfare reform bill, it is being placed at the discretion of jobcentre advisors who can decide to subject any claimants to it who would “benefit from the habits and routines” of unpaid labour. Faced with the accusation that the government is simply punishing the unemployed at a time when its cuts are set to add hundreds of thousands more to the dole queues, the Tories and Libdems insist that jobs are out there. Late last year, Work and Pensions secretary Iain Duncan Smith argued that long-term unemployment in towns such as Merthyr Tydfil was down to people not bothering to commute to neighbouring towns and cities where work is available: "The truth is there are jobs. They may not be absolutely in the town you are living in. They may be in a neighbouring town ... we need to recognise the jobs often don't come to you. Sometimes you need to go to the jobs." The unemployed needed to stop being "static" and "get on the bus" to where the jobs are. Such arguments are not only offensive, coming as they do from a cabinet stuffed full of millionaires and aristocrats, but are also utterly wrong. According to research conducted by the PCS union2, there are 15000 unemployed people in Cardiff chasing just 1700 jobs - nine jobseekers for each job. Furthermore "The number of people out of work in Merthyr and Blaenau Gwent combined was more than the total number of job vacancies for the whole of Wales." In March, the TUC published research3 – unhelpfully broken down by party control of constituencies - showing that in Labour seats (in other words mainly seats which are urban and usually poorer), there are nine Jobseekers allowance claimants per job vacancy. Even in Tory seats (usually suburban or rural and frequently more affluent), there are almost five claimants for each job. This excludes the long-term unemployed on other benefits, such as Income Support. Ultimately, this shows us that the problem isn't with the outlook or mindset of claimants, or with millions of “workshy scroungers” living on handouts. It's just maths – when there are more jobseekers than jobs, you get mass unemployment. Bashing the poor is simply a scapegoating exercise when those who genuinely caused this crisis, the capitalist class, get tax cuts and free reign to return to pre-crisis bonus levels. Even if it was the case that the long-term unemployed need to be cajoled into working, who honestly thinks that an employer is going to pick them over the many thousands laid off since the crisis? Written for the March 26th demonstration edition of Freedom newspaper. That's a great article, thanks for posting that. Excellent! There sould be articles like this!